This hill is named Mogarlyandoon on William Bald's map of Co. Mayo (1830). This is clearly from Ir. Magairlí an Deamhain, 'the demon’s testicles', (see Devilsmother). The name appears to refer to hillocks on this ridge. There is another instance of this colourful name in Glencalry (between Slieve Fyagh and Maumakeogh) on Bald's map, where it appears as Moggerlyandoon. 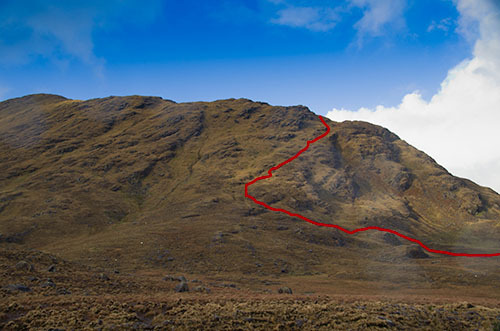 There is also Magairle, a western spur of An Chailleach in the Twelve Bens, marked on Tim Robinson's map of Connemara. Devilsmother Far North Top is the 284th highest place in Ireland.